This entry was posted on Monday, September 12th, 2016 at 9:17 pm. I may be a 30-something, but that doesn’t mean I don’t enjoy some excellent young adult literature because, let’s face it, we’re all still young at heart, right? 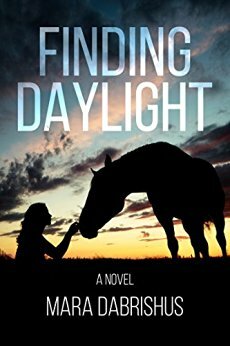 Over the Labor Day weekend, I jumped into Mara Dabrishus’ horseracing novel, Finding Daylight, and couldn’t put it down. Young jockey, Georgie Quinn, and fierce filly, Sweet Bells, are unstoppable. The public sees them as the golden pair, their victory in the Breeder’s Cup Classic is just further proof of their top level status. What the public doesn’t see is Georgie’s disastrous home life. Her family’s horseracing farm in Ocala, Florida, is falling down around them; her father is an alcoholic whose glass of whiskey is his ever-present companion; and her mother seems oblivious to everything and everyone. But at least Georgie has Sweet Bells…until she doesn’t. After one poorly-ridden race, Georgie is sent packing and, for the first time ever, her professional life takes a turn for the worse. But Georgie is a naturally-gifted rider, and she’s determined to reclaim her throne and her title as Sweet Bells’ jockey! Mara’s writing is beautifully-descriptive, and it’s clear she knows horses and the world of racing. If you love horseracing, a little romance, and a lot of drama, you will love Finding Daylight. I just downloaded one of Mara’s short stories, Whirlaway, and can’t wait to dive in!